It's a ukulele slugfest uniting knockouts from the four-corners of the "jumping flea" world. Some charmers write original songs inspired by a love of rock and roll and indie-pop. Other challengers are inspired by Tom Waits and The Tigerlillies' brand of dark humor mixed with jazz and blues. And then there are those contentious ukie-weights motivated by Sixties folk singers or Twenties tin-pan alley artists. The unifier is the instrument and the idea that all types of music are adaptable to the little four-string wonder. 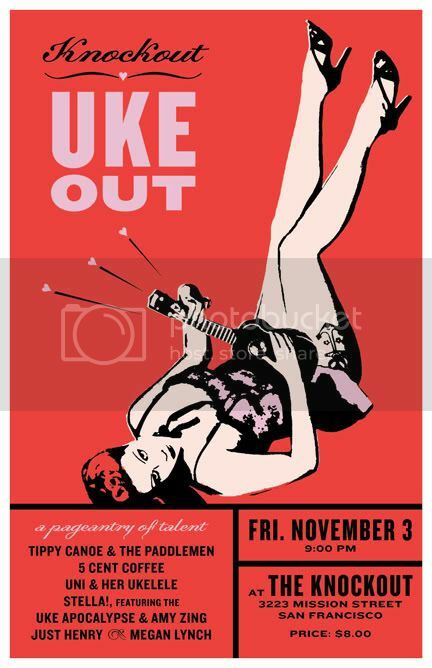 This year's Knockout Uke-out features the players from Ukey-Stardust. This was the show where David Bowie's "Ziggy Stardust and the Spiders from Mars" was performed from start to finish--from "Five Years" to "Rock and Roll Suicide"--on ukuleles, saw, bull fiddle, melodeon and drum. This is the chance for those who loved that show to hear these cagey ring warriors exchange blows in their own weight class.